We have inherited from our ancestors the centenary olive trees, most of them belong to the arbequine variety. They are not very vigorous trees but very resistant to the climate that affects this area of the Ebro Lands, with very hot and dry summers and very cold winters. Their fruits, the olives, are small but they have an extraordinary quality because of the juice they contain, the extra virgin olive oil. The tradition of the cultivation of these centenary arbequine olive trees complies with all the rules established by the Catalan Council of Ecological Agricultural Production(C.C.P.A.E.). 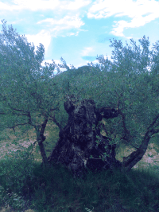 The olive tree fields, situated near the Mediterranean forest use the rain water in order to transfer nutrients from the forest to the olive trees due to our orography of the land, ie. Slopes and terraces, and moreover to the pruning and the corresponding cultivation. Most of the organic farming fields are situated towards the South West which provides sunlight from when the sun rises until it sets which adds quality to the olives. 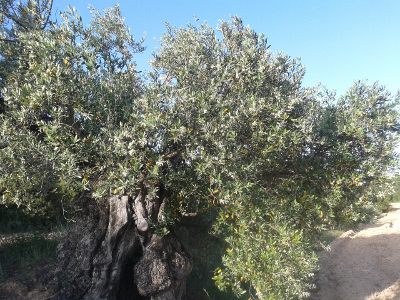 Olives start to ripen at the beginning of November, when it is the harvest time. Olive tree branches are combed by hand in order to not to damage the olive tree or its fruits. When olives are about to ripen, is the best time to obtain an excellent olive juice from agood fruit, the extra virgin organic olive oil extracted from the first pressing in cold.